Lolcatese — is it becoming the new internet pidgin? Perhaps first exclusively written language? Lolcatese is named after the acronym LOL, which is Textese for “laughing out loud.” Textese is a thing distinct from Lolcatese. The purpose of Textese is to transmit the message with the fewest number of keystrokes. Lolcatese and Textese have similar ancestry, but Lolcatese seems to be evolving into a separate language all its own, complete with grammar and spelling conventions, and even pronunciation hints, although Lolcatese is primarily a written language. I’m not sure where the “cat” part comes in. Non English influence: A lot of people blog, post to forums and social network in English when it’s not their native tongue. Their systematic grammatical errors become part of the patois when the meaning is sufficiently clear. Native speakers start to use these “errors” as well, either just to fit in, or as a shorthand. Grammar police do not take Lolcatese seriously as a language — such is the fate of pidgins,patois’ and creoles in general. But socio-linguists do, because they know that historically, a major world language, (English, for example,) might emerge from some unlikely low-class cobbled-together pidgin between Norman and Anglo-Saxon. We may be forced to contend with Lolcatese, and with the speed at which things move on the internet, it may be sooner than any of us imagine! verbs of being disappear and are simply implied and understood as in Russion or ebonic. Below is a portion of my Eleven Signs post translated automatically into Lolcatese courtesy of Lolinator. The Lolinator does a great job, but it is still a program. Could you do better?? u suk stumbla… reada… friend… n surfa… i beg ur indulgence just thiz once. permit me 2 take break frm providin u high qualitee dorkage that u come 2 take 4 grantd n let off major bitchy rant. if i don’t do thiz i’m goin 2 blow gasket!!??!! wtf causin my consternation??! rampant mediocritee!!??!! basicalli i iz fed up wit sucky bl0g. why do we put up wit sucky bl0g??! in theory free market darwinism would cause them 2 witha away… so i can onli venture guess that there iz stil need 4 education on just wtf constitutez sucky bl0g. perhap u aren’t so confident bl0g connoisseur. if not… please allow experienced dork 2 educate u.
how do u know if ur bl0g suckz??! sum cluez…. uninvitd music: u play ur choice uv music when page load without askin my permission. how do u know i’m not playin sum otha music or that my famili not fast asleep??! ur music mite b grate but that not point. when u inflict it on me without askin permission u has just demonstratd that u r rude person n i wil close ur bl0g immediateli n ban it. bloatware: ur bloatware bl0g load so….slow…. forget it… i’m history. i don’t wait 4 bl0g unless i alreddy know they worth wait. put it on diet 4 heaven sake!!??!! As a language, Lolcatese has a certain appeal. It’s easier to learn than English, and it seems to be the lingua franca of the internet for social communication. The young will bring it forward with them as they age into the mainstream of society. It will infiltrate first to international trade, music and sports, then gradually the rest of society(ies) will catch up. In as little as another generation, there will be youngsters born who write Lolcatese before English. For these people it will be their mother tongue as far as written languages go, and they will push its expressive power as it graduates from becoming a written pidgin (written by no one natively) to a written creole (a pidgin derived language that acquires native writers over time). Will people’s writing backwash and influence their spoken language? That remains to be seen. Perhaps we will have a generation of dialectical bilinguals such as the Germans or the Chinese, where everyone writes a standard dialect but everyone speaks a specific dialect, which can be almost unintelligible to the other dialects. NPR audio about how the web is changing language. Prediction for the future: Your grandchildren will receive high school diplomas written in a recognized and formalized evolved version of Lolcatese, especially if you are from an emerging country that is broken into a lot of dialects and needs something to standardize on. I agree with you 100%, except I do derive great pleasure from saying such things as “pwn sum noobs”, or thatzz hellza pwnzr”. Other than that I have tried to maintain a personality filled with semi-intelligent statements. Even if I am “pwning sum noobs” in one of my much adored games. Just recently I received a SMS from my teenage daughter, could not understand a single word. I just replied ‘nice to hear from you, I hope you are keeping well’. The only time the kids use perfect language is when they are asking for money. My point exactly. (My sociolinguistics background is coming out now.) What was once snubbed as a very “unintelligent” patois for engaging in very mundane business conversations in England many centuries ago turned into English. I get some fun out of LOL’s myself. At this point it’s not rich enough to do a term paper in or discuss philosophy, but expressivity evolves with language. Another interesting thing about LOLcatese is that it’s primary topics are social and not commercial. That is why it is rich in social expressions but how would you negotiate at a market in it. 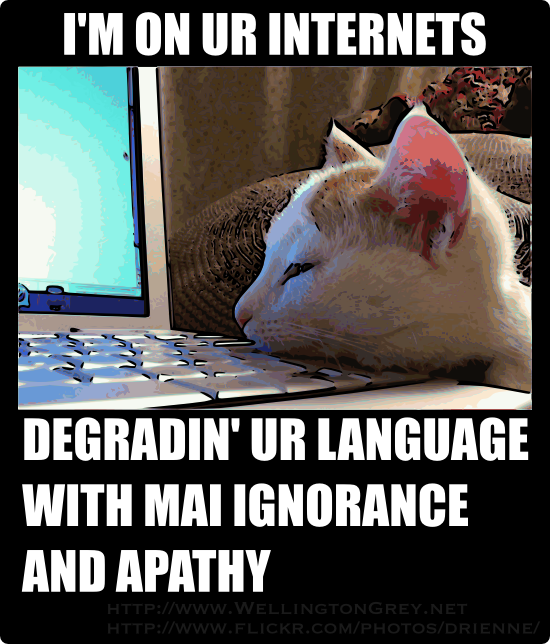 U reddit here 1st mai frens LOLcat will pwn U! Maybe it’s because I am old school, but I see this as a very dangerous trend. Perhaps it is fine for the Internet, but are young people going to try and take it with them some how in the market place or to work. I’m kind of floored by all this. I see it on the Inte4rnet but didn’t realize how pervasive it is becoming. Not dangerous, just something we need to be aware of. The essence of socio-linguistics. All languages evolve to meet the communication needs of those who use them. Young people are already incorporating phrases from LOL at work. I’ve had truck with stuffy preservation “authorities” such as the Academia Real from Spain, trying to preserve the “purity” of Spanish, which is in reality a degraded form of Latin, with no small measure of Arabisms thrown in. No thanks. Those guys are tiresome and defensive academics who are hopelessly out of touch with their own popular culture. If a language can’t adapt, it dies. If people can’t tell which way the wind is blowing they get left behind. End of story. And humanity moves on. I tried to subscribe to your RSS using FeedDemon but I get the following error: unexpected T_STRING on line 26, I don’t think I’m doing anything wrong, does anyone have any idea how to fix this, thanks. Calling that a legitimate form of english is the same as saying typing in 1337 is as well. well, it’s a matter of usage. If everyone in the world was using lolcatese to communicate, and it had evolved the richness of an established language, you using your “standard english” that no one else even knows would be seen as a stuffy relic of the past. Just sayin’. That’s how English got started if you look into its history. The proper language was French for rich people who sat around drinking wine, but the real stuff got done in the Saxon/Norman patois that later became English. Assisted me a lot, just what I was looking for this web blog . Aw, this was a very nice post. In thought I want to put in writing like this moreover – taking time and actual effort to make a very good article… however what can I say… I procrastinate alot and on no account seem to get something done. Your page is looks mercy, your graphics are sweet, and what’s more, you use reference that are relevant to what you are saying!